One day, the horse became very ill and he called the veterinarian, who said: "Well, your horse has a virus. He must take this medicine for three days. I'll come back on the 3rd day and if he's not better, we're going to have to put him to sleep." "Be strong, friend. Get up or else they're going to put you to sleep!" The goat came back and said: - "Come on buddy, get up or else you're going to die! Come on, I'll help you get up". Let's go! One, two, three... but the poor horse wouldn't get up! "Unfortunately, we're going to have to put him down tomorrow. Otherwise, the virus might spread and infect the other horses." 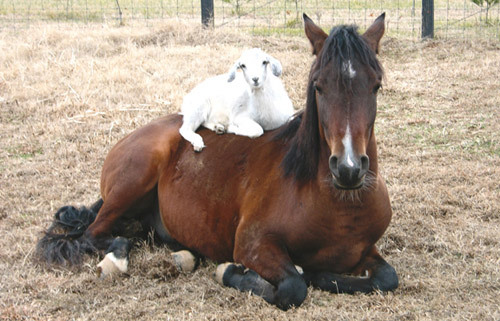 After they left, the goat approached the horse and said: "Listen pal, it's now or never! Get up, come on! Have courage! Come on! Get up! Get up! That's it, slowly! Great! Come on, one, two, three... Good, good. Now faster, come on...... Fantastic! Run, run more! Yes! Yay! Yes! You did it, you're a champion!!!"